If you prefer a natural wood for decking that does not require as much maintenance, think about using teak wood or IPE decking. 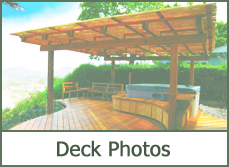 Both these materials are tropical hardwoods that are extremely weather resistant and great for use on decks that are built in areas prone to moisture. 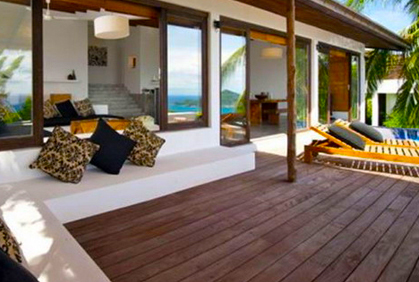 However, the best outdoor lumber tends to be IPE because it is the sturdiest type of wood available on the market. IPE wood is made from Brazilian walnut and is great for veranda decking because it is extremely durable and water resistant. 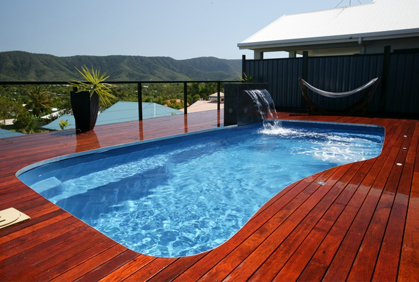 Because IPE is able to withstand the damaging effects of water, it commonly used to construct docks and boardwalks, making it the perfect choice for above ground pool wood decks. The only downside to using this wood for decking material is that it tends to be very expensive. 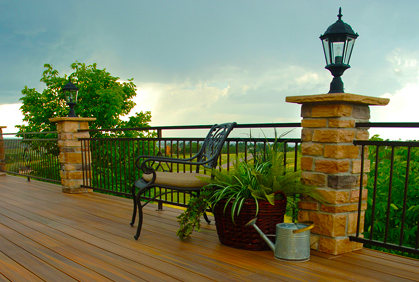 For those on a budget, look for wood for decking alternatives such as composite lumber. 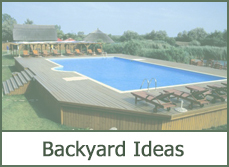 Composite decking is great for pool deck design plans because it is an artificial lumber made from combining wood fibers and plastics to create a durable and water resistant material. 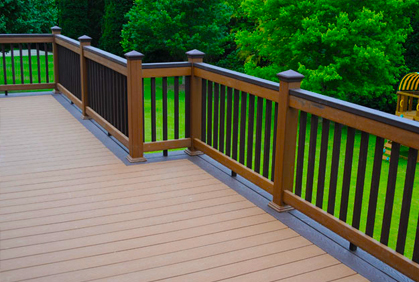 Not only is composite decking long lasting and weather proof, but it comes in a variety of different color choices and textures so you can achieve the look of real wood without having to stain or paint it yourself. Similar to the engineered wood for decking flooring installed inside homes, composite decking is most commonly used for areas that are prone to moisture. Composite decking is great for near outdoor pools, in tropical locations, and those areas that receive a lot of rainfall. 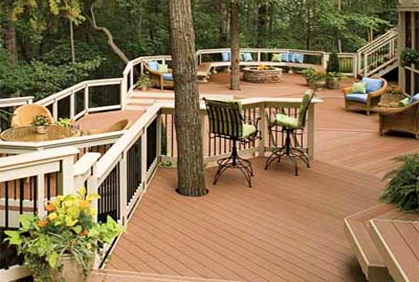 When making the choice between wood vs composite deck designs, the latter option tends to offer more benefits. 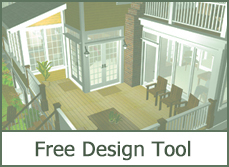 Our gallery of pictures of 2016 wood deck ideas are the best inspiration for your design scheme because it offers ideas on construction, styles, colors and decorations for the area. Natural wood is superior for visual appeal, however, composite is an inexpensive wood for decking, long lasting, and weather resistant, does not require staining or sealing, and is easy to clean and maintain. 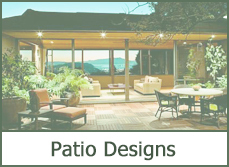 Keeping the surface clean and free of dirt and debris is the best way to maintain the beauty of your deck and extend the lifespan of your outdoor living areas. How to clean a wooden deck is a simple task, requiring a broom to sweep away dirt and debris before using a hose and mild detergent to wash the area. Once you have determined the type of wood for decking material you will use for your wooden deck you can start to think about design options. 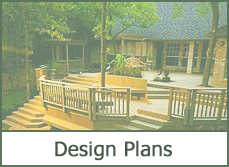 We have images of various types of wood for decking floor designs as well as different designs for wood for steps, railings, and balusters. 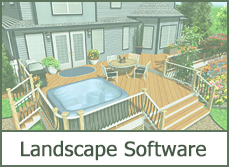 For homeowners who are uncertain of what design plan to use or like to change the look of their deck often, wood for decking tiles is the perfect choice for you. These tiles are placed overtop your deck to create a type of floating surface that does not damage the existing flooring. 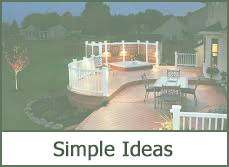 How to build a wood deck with tiles is simple because they connect with interlocking tabs that make them easy to assemble and can be changed often. 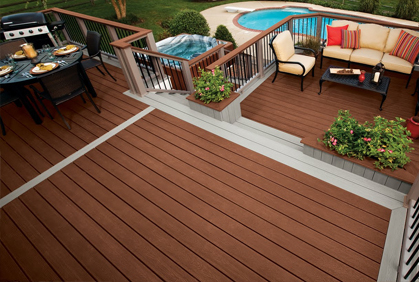 Keep in mind that the floor is not the only vital component of your deck. 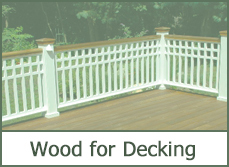 Popular wood deck railing ideas include cast iron balusters, solid wood rails, and ornately carved posts that will accentuate your home and create a beautiful space.